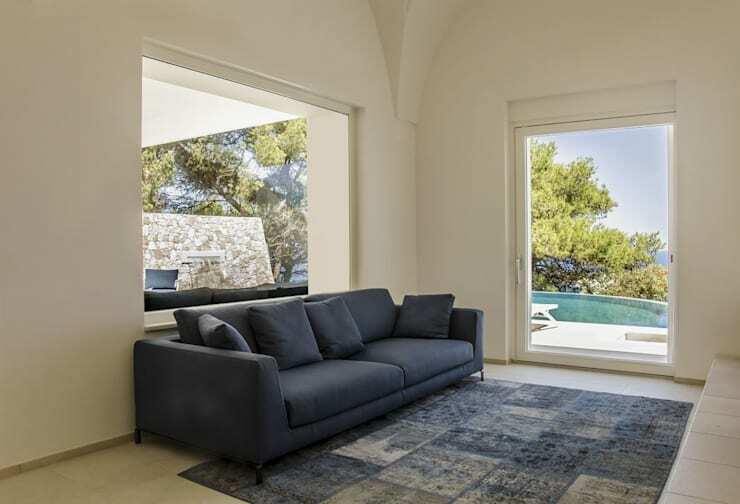 homify 360° transports you all the way to Southern Italy – Salento, to be exact – to discover what a dream in concrete structure looks like. Sebastiano Canzano Architectural firm was tasked with the renovation of an existing villa and to transform it into a contemporary dream, suitable for both family living and stylish dwelling. Before the makeover started, this dream villa was completely different, with an introspective style and materials that politely requested a chic transformation into the modern architectural realm. No easy task, of course, but judging from the images we are about to inspect, it is not too early to state that their task was a colossal success. At first glance it feels as if we have set foot in Santorini, Greece – pure white concrete set against a dream-blue sky and crisp aqua waters. But Salento is proudly Italian (located on the “heel” of the Italian boot-like country). This modern 250 square metre villa is situated on a rocky hill, covered by blooming Mediterranean vegetation. Planting the house right between a rich collection of olive trees and the crystalline sea, it is a pristine spot amid flora and ocean. The white contemporary setting positively glows from this angle and it takes every pinch of self-control to abandon the viewing and dive into that alluring blueness of the pool. A crystal-blue infinity pool that combines the terrace with the sea of Salento, waving at us from beyond the fresh, green olive trees. Strong scents of pine, vineyards and sunburnt rocks are carried up towards us by the wind, while we are safely shaded from the sun on this splendid terrace of pale tile texture. The curved design of the pool is no accident – it has been planned that way to reflect the slopes of the sea, making every dip feel like a dive in the ocean. The soft, round curve of the pool offsets prominently against the terrace’s strong, square surface. A rock-textured wall at the side of the infinity pool proudly holds a contemporary water feature: a miniature waterfall, to add to the tranquillity of the terrace and that extraordinary panoramic view. Open and clean, with the soft whispers of wind and water as company, a swim here is sure to revitalise anybody! For glimpses of other modern swimming pools clad in contemporary fashion, see: Luxury Swimming Pools. We've managed to tear our gaze away from the heavenly terrace and have ventured inside. Hammered stone floors welcomingly cool our feet, cleverly inserted to enhance the continuity between the exteriors and interiors. Wide and spacious, with clean finishings and minimum décor, the designers have opted for dark blue furniture to link with that loving ocean view waiting for us outside. Wide glass windows and doors allow for a refreshing amount of natural light. 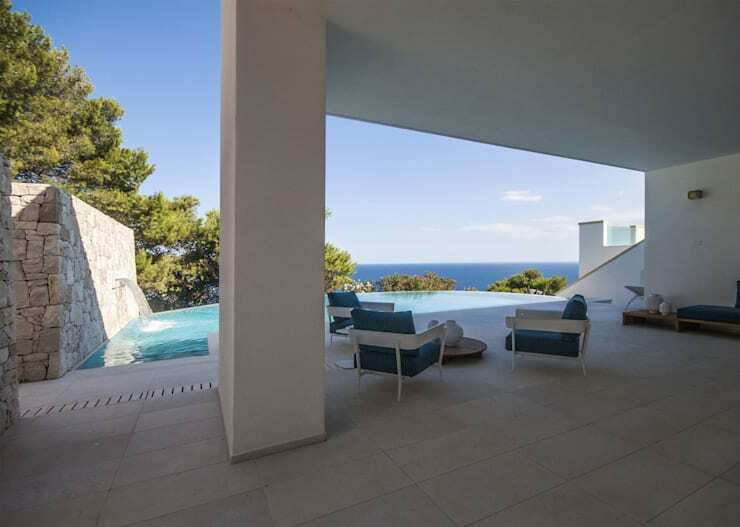 The architects have managed to give a concrete personality to the villa, defined in a contemporaneous style and integrated perfectly into all facets of this vision. Modern elements are everywhere, yet the luxury has been approached in a minimalistic way in order not to distract from the architecture. What other wonders can we expect from the rest of this contemporary oasis? Viewing the dining area from this angle, it is as if a face is formed on the wall. A slight protrusion from the wall shapes a head, with two wall lights standing in for illuminating eyes, lovingly (and calmingly) watching over every meal (or fun socialising) that is sure to be enjoyed here. 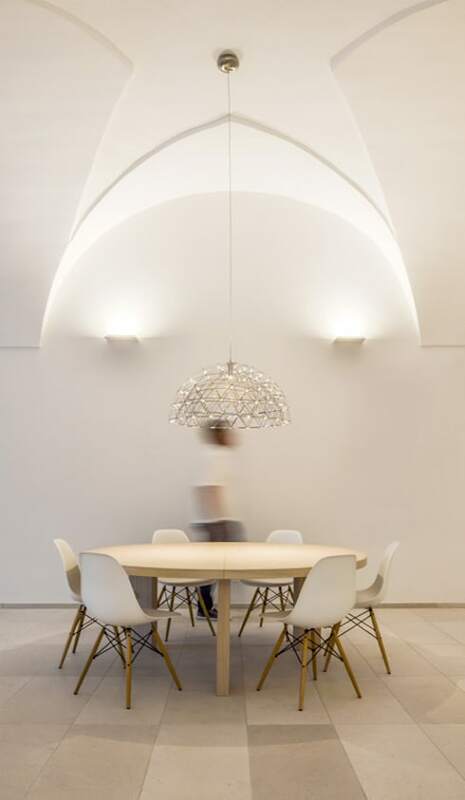 A round dining table from light timber, white dining chairs with caramel-coloured legs and a modern hanging light that seems to be created from sparkling fairy lights, complete our contemporary dining experience. The villa houses three bedrooms, each one with its own private bathroom. The clean and fresh interior look continues here but with no dark blues – instead, the designers have relied on a soft palette of creams, whites, and a light tease of magenta. Minimum décor, a light-wooden panelled wall, full-length mirror and three-legged modern side table (the darkest spot of colour in the room) complete the contemporary layout. A corner wicker chair neatly frames the area, efficiently balancing with the wooden framed mirror on the other side of the room. A prime spot for slumber, reading or just passing through on your way to the rest of the house. 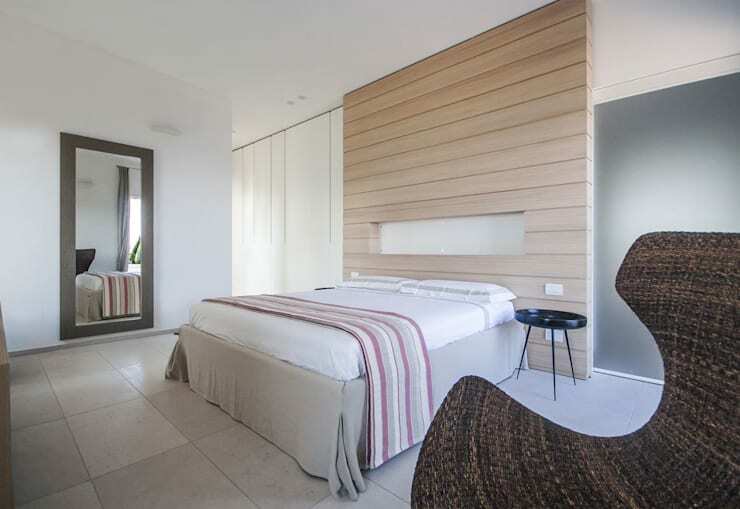 See for yourself how this bedroom compares to other modern-styled bedrooms. If one swims, dines, and sleeps in style then one must surely be able to cleanse in style as well. No need to fret, as each of the three bathrooms offers a unique area for your washing and drying experience. The interior materials used in the rest of the house continue here, however, to produce a slight variation, the designers have opted for a polished and lightly brushed stone interior. 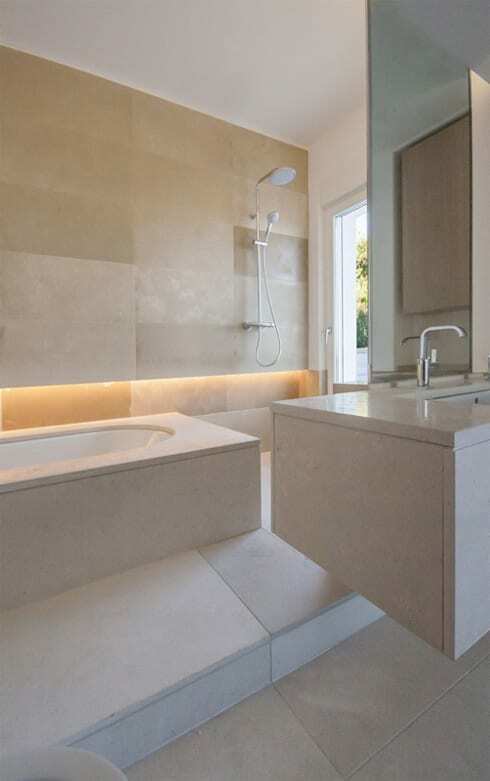 Just marvel at that soft wall and floor, which manages to seem warm and cool at the same time (making for bathing an excellent experience in both summer and winter). Speaking of winter, chilling interiors won’t be an option, as the house is equipped with a floor heating system, assisted by solar panels. In addition, the home owners have installed a sophisticated home automation system, complete with remote control! Darkness starts to settle in but modern lighting illuminates the exterior and does a fantastic job of making the terrace and swimming pool seem tempting. Swimming laps, lounging on one of the couches and getting lost in that ocean view, busy preparing a meal at the barbecue corner… is there anything here that does not seem appealing? The initial idea of the architects and designers was to emphasise and highlight a total openness to the views of the sea and combine that with a rational and contemporary collection of interior spaces without distorting the spatial sense. What started as a tricky challenge has ended in a sophisticated creation, making this villa seem like a modern deserted island, complete with gentle interiors, caught between sky and sea.